LiveIn Magazine, with Editor Pamela Quinzi and Jessica Ross attended the Jhpiego’s Benefits Gala “Laugther is the best medicine” Honoring Mr. Gianopulos, Chairman and CEO of Paramaount Pictures and his wife Ann with the Elyse Bila Ouedraogo Award for their philanthropic and volunteer efforts on behalf of women and families and their outstanding support of Jhpiego’s global mission to prevent the needless deaths of women and families. May 1st at the Beverly Wislhire Hotel, Beverly Hills CA. Jhpiego is an international helath care non profit and affiliate of Johns Hopkins University. For more than 40th years, Jhpiego has empowered frontline health workers by designing and implementing effective, low cost solutions to strethen the delivery of health care services for women and their families. 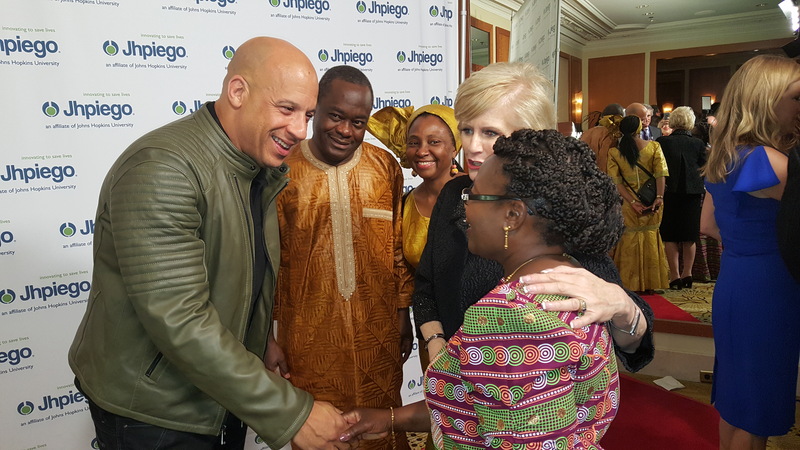 Jhpiego works to break down barriers to high quality health care for the world’s most vulnerable population. The event’s cohosts of the night during the Gala dinner were Kent, President of Comedy Central and Dr. Michele Brennan. Part of the event were also Al Madrigal, Melina Kanakaredes, Tom Papa, Jamie Denbo, Mena Survari, Brroke Burke. Wearing designer silk never felt like this. This good. A powerful sense of doing good that comes with tucking a swath of protective mosquito netting around a sleeping mother and child living half a world away. An objet d’fashion, the Women of the World scarf is the creation of Collection 18 Art Director Rachel Rowberry and designed exclusively for Jhpiego, a global health nonprofit saving lives, improving health and transforming futures in the world’s poorest places. Like other silks you know and love, the scarf conveys impeccable fashion sense – and wraps mothers and children around the world in health. For more info visit www.jhpiego.org.